This page last modified 2008-01-02 15:08:21. Before the overlord room, at the intersection, he is in the room at the end of the north hall, he spawns by the fire in the middle, there are 2 other spawns in there, 1 on each side of him, can single pull him out into hall. 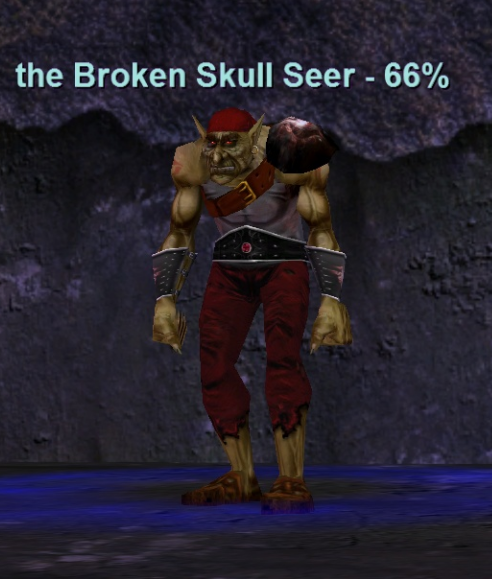 He hits just a bit harder then other mobs maybe 188 max if I remember right, he casts shaman spells but never has a pet. Is there a spawn time on this guy? The mobs in his room respawn about 24 minutes after they died. He or his placeholder will also spawn about 24 minutes after whichever one was up died. #nillawafer, Posted: Jul 02 2003 at 12:43 AM, Rating: Sub-Default, (Expand Post) Don't you love people that report what loot mob drops but fail to say where its located at. Where does the mob spawn ? How hard is he ? RE: Where does he spawn? The place holders for this Mob had a 26 min spawn timer. No clue on how often on average this guy spawns.